Put on your driving gloves and lower yourself into a comfy seat, because you’re going to be there some time. Driving across Europe has never been so much fun. Drive along an array of motorways and major roads linking European cities. Enjoy the spectacular scenery along the way. See pictures of the action from Euro Truck Simulator 2. Don’t forget to read our review as well! This simulator game is going to be a favourite for a long time! 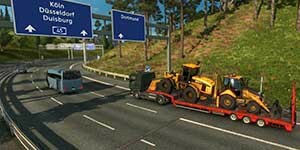 See first hand action in Euro Truck Simulator 2, with our walk through and demonstration videos. © 2019 SHORTYSGAMES | Gaming Reviews. All Rights Reserved. This site links to products & services that may pay us a fee if you buy. If you click Google ads, we are paid a teensy amount even if you don’t buy. Thank you fans!